West London Eagles Under-19 men made a winning start to phase 2 of the National Under-19 Championship on Sunday beating Stroud. 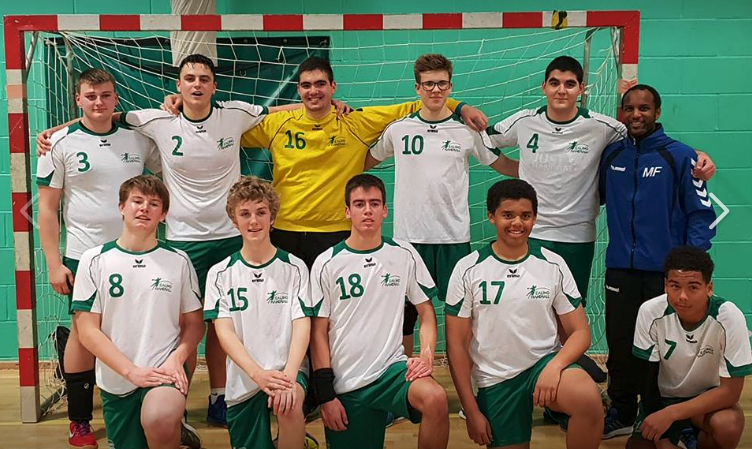 The Eagles U19 men’s team were in action at Stoke Mandeville as the next phase of the Under-19 Championship got under way and maintained their 100% record this season with a hard-fought 16-14 win over Stroud. The team was without experienced playmarker, Razvan Mihaila, injured, and their job was made even harder when the referees handed out a hasty blue card to Saimonas Urbutis after just 10 minutes. The team had to dig deep to stay in touch with the always improving Stroud team and were effectively working with the Under-16 line-up at the back, but they held their nerve and at the break the scores were tied 6-6. The team fought hard in the second half and slowly managed to pull ahead and hold on for a well-earned 16-14 win, with the new young players playing their part in the team effort. Versatile player Antoine Carton was named man of the match, while Tomas Dos Santos Moniz was top scorer with 5, followed by Evan Mark on 3. Captain Mateusz Florczak was proud of the win as ultimately it was a great team effort to stay focused after the unfortunate distraction of the baffling early blue card decision. Team (goals): Rodrigo Moniz (GK), Mateusz Florczak (1), Saimonas Urbutis (2), Tomas Moniz (5), Cian Baxter (2), Evan Mark (3), Myles Gannon (1), Sam Nuttall, Nathan Toogood, Antoine Carton (2).